June in Ohio means the beginning of summer! While we and our pets generally love to be outdoors when the weather is nice, we need to make sure to protect them from summer dangers. These include the dangers of hot pavement and cars, the sun, and the ocean and chlorinated water. First and foremost, it is very important to know what to do if your animal happens to become over-heated. Your dog or cat may respond to overheating with exaggerated panting, lethargy, bloodshot eyes, red gums and tongue, elevated temperature and/or hot paw pads. In this situation, please call an emergency veterinarian whom should be able to tell you how to treat your dog before you get to the office. In general, avoid shocking your animal’s system with freezing water or ice cubes. You may spray them with a garden hose (about 50 – 55 degrees) and give them small amounts of cool water to drink. Apply rubbing alcohol to the paw pads and underarms to help expel heat from their body. The best way to “treat” heat exhaustion is prevention. So please keep your animals out of cars in the warmer days, even with the windows down or cracked, temperatures can soar, endangering your animals’ lives! Outside animals need to have always-available access to shade and fresh, cool water. And contrary to popular belief, shaving your pet does not always make them cooler. Depending on the breed of your dog or cat, shaving them can actually make it harder for them to regulate their temperature in the summer. Ask your veterinarian for a recommendation based on your animal’s coat on whether or not shaving them would help to keep them cool. Another problem in the hot, sunny summer is hot pavement and asphalt. If you can’t walk on it with bare feet, your dog or cat shouldn’t either! Paw pads can become burnt and sore, so please walk your animals in the grass during these warmer months, and limit exposure to these areas. Just as we can get sunburns, our animals can too. White animals, shaved animals, or animals with sparse fur may get sunburns. Keep these animals out of the sun during the times when burning is most likely. You may put sunscreen on your animals to protect them from the sun as well. Lotions are best because sprays can burn eyes. Going to beach with your dog? Make sure to rinse coats well of salt water as well as chlorine. Both can dry out coats and make your pet itch! Keep ears as dry as possible to prevent ear infections, and remember to clean them out well after swimming. If you have an animal-accessible pool, please allow pets near it only with supervision. 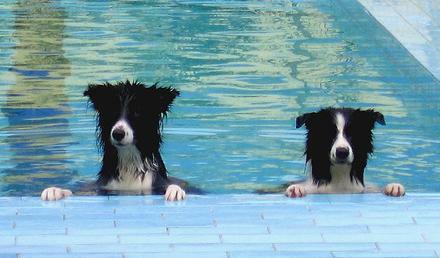 Even good swimmers can get into trouble if they cannot get out of the pool. Keeping these precautions in mind, you and your animals should be able to enjoy the summer months! If you have any worry that your animal might be overheating, please call your veterinarian or local emergency veterinarian for advice.